Not long after he became president in the wake of the Sandusky scandal last November, President Erickson vowed that Penn State would eventually become a national leader in the prevention and treatment of child sexual abuse. That idea resonates with me, and I hope with lots of other people, because it seems like an ideal way to atone for what went wrong here. It takes the thing we’re now known for in the worst possible way, and makes it the thing we’re forever known for in the best possible way. As one initial step in that process, Penn State announced Wednesday that it’s hosting a national conference Oct. 29-30 on the topic of child sexual abuse. 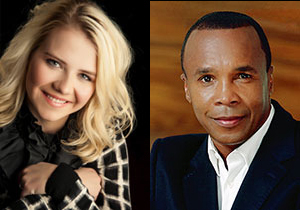 Organizers have lined up two prominent abuse survivors as keynote speakers: boxing champion and TV broadcaster Sugar Ray Leonard, and Elizabeth Smart, who as a 12-year-old was abducted from her home in Utah in 2002 and found nine months later (she’s now a student at Brigham Young University). In between the keynoters are seven sessions with respected academics and practitioners from across the country who, according to co-organizer Kate Staley, “know how to translate their knowledge for the general public.” That’s worth noting about the conference: It’s aimed not at scholars, but at laypeople. Registration cost is $145 for the general public and $45 for students. You can see the full conference schedule and register online at the conference Web site. Entry filed under: Uncategorized. Tags: child sexual abuse, Elizabeth Smart, Sugar Ray Leonard.